Some of you may have already become aware that Barlaston now has its very own Community Speedwatch Group. 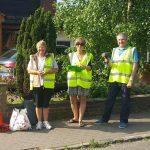 Lead by Co-Ordinator and Parish Councillor, Dave Norman, he is one of 12 Volunteers now active within the village, across 9 different locations. Please look out for them and encourage your friends and family to do so too. Dave has been working closely with the Staffordshire Police Community Engagement Co-Ordinator to ensure that our volunteers are properly trained and all the locations fully risk-assessed. The Group is currently trialling different sites and timings for the regular 1-hour monitoring sessions but would be pleased to hear from any residents who feel there are regular hot-spots to consider. In May there were 5 sessions during which almost 800 vehicles were counted, of which 40 were recorded as travelling at 35mph or above. The actual speed limit is, of course, 30mph – and the details of those 40 vehicles are shared with the police who issue the drivers with an appropriate “reminder” letter! 2nd time offenders receive an escalated version as a final warning with notice of further Police action to be taken if the speed limit is ignored again. The first 2 sessions in June have further highlighted just how busy the Barlaston roads are – with 340 vehicles counted in 1 hour on a Wednesday afternoon in Station Road and 16 vehicles recorded as exceeding 35mph in 1 hour on a Monday morning in Meaford Road. If these statistics are considered in the context of a full day then, hopefully, all residents will appreciate why it’s so important that everyone remains mindful of driving speed – and thus helping ensure the safety of us all within the village. A pedestrian hit at 30mph has a very significant 1 in 5 chance of being killed. This rises to a 1 in 3 chance if they are hit at 35mph!